With over 19 years experience you can rely on our dedicated and qualified team in all prescribed and non prescribed electrical work, there’s not much we can’t do. 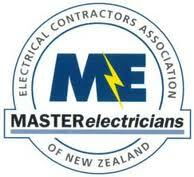 From replacing a power point to wiring some of Auckland’s most sophisticated homes. If you’re looking to upgrade your bathroom, modernise your kitchen or add street appeal to your home with landscape lighting. Home Automation, Wiser-Clipsal C-bus, Vantage, Dynalite, Control 4, AMX, Lighting, Underfloor-Heating, Blinds, Curtains, Pools, Spa’s, Audio, Garage Doors, Gates, Landscape Lighting, Irrigation. Multi Room Audio, Touch Screens, Keypads, Speakers, music Servers, Ipad/Ipod doc’s. Multi Room Video, Projectors, Plasma’s, LCD/LED TV’s, Multi Room SKY. 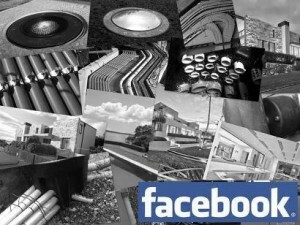 Phone and Data, Cat 5/6, PABX’s, Computer Networks. Gate Automation, Automatic Gate Openers, Intercoms, Remote Control Access. Access Control, Key-less Entry, Proximity Readers. CCTV, Closed Circuit Television, WiFi Camera’s, HID Recorders. Power Hire, 3 Phase Life Guards, 3 Phase Extension Leads, Multi Boxes, Single Phase Extension Leads, PDL to C-Form 3 Phase 32amp Adapters, In-Line 3 Phase 32amp RCD Boxes. 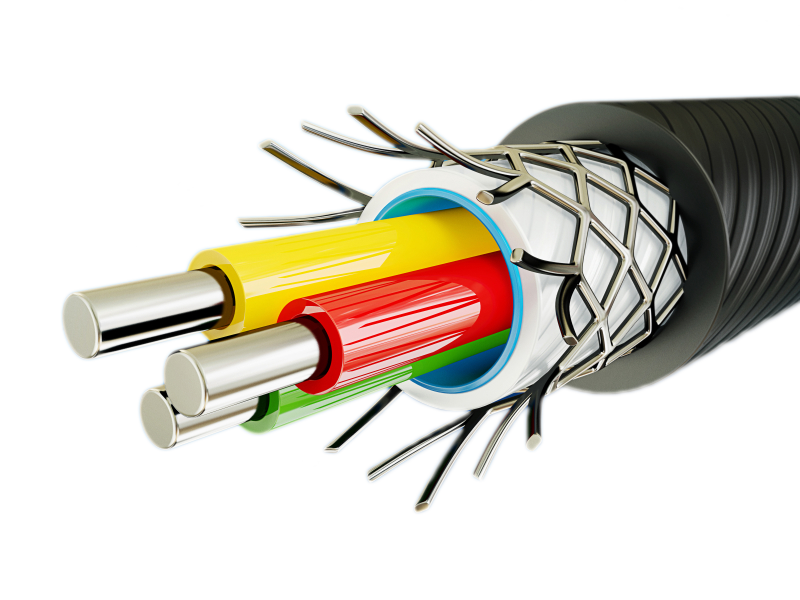 All Electrical Installation & Maintenance, Mains, Switch Gear replacement & Additions, Pre-Wire’s, Rewires, Hot Water Cylinders, Switch & Meter Board Upgrades, Data Cabling, Electrical Testing, Lighting Installations, Motor home & Caravan Installations, Temporary Power Hire. Click Here to view our practicing licence details or on image below to view our Facebook Photo Gallery. We should all be aware of the significant new changes to the ECP-54 “Electrical Code of Practice” relating to insulation and recessed light fittings. With higher mandatory levels of insulation required by New Zealand building code, to create more thermally efficient insulated homes and with the use of energy efficient recessed light fittings we can all benefit. 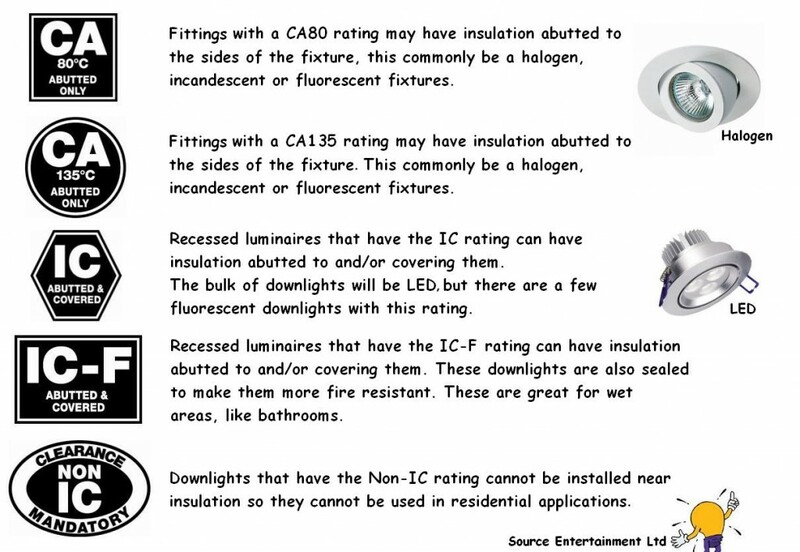 PROBLEM The use of “unsafe” recessed lights with combustible “non flammable” insulation material requires a larger clearance between the insulation and the recessed light as pictured in diagram on left. This results in heat loss and making it more costly to heat the home. Unrated recessed lights that do not have a built in thermal cut out are not deemed a fail safe option. SOLUTION By using a non combustible insulation like Pink Batts and a CA-“Close Abutted” rated recessed light fitting with thermal cut out. This allows the insulation to be abutted directly against the recessed fitting reducing heat loss and making it more efficient to heat your home as pictured in diagram above. Recessed luminaries that have the Non-IC rating cannot be installed near insulation therefor cannot be used in residential applications. Any luminaire that is unmarked is considered to be Non-IC. It’s important to note that most drivers and transformers must be mounted on top of the insulation. If you are intending to cover your downlights your electrician and builder will need to be involved to ensure correct instalation. Feel free to ask us installation instructions on such downlights. Under the “Warm Up New Zealand” Heat Smart Scheme you can receive a 33% or up to $1300.00 Energywise contribution if you’re getting your home re-insulated through an authorised insulation installer. Please be aware that you may still be left with 100mm cut out clearances around your down lights even if IC approved fittings are used. Most EECA authorised installers will not cover any down lights with insulation.